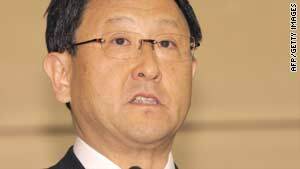 Akio Toyoda: "Starting to see some sun on the horizon" for Japanese automaker. Tokyo, Japan (CNN) -- Toyota returned to profits for the fiscal year ending in March, despite the continuing economic downturn and a series of recalls that rattled consumer confidence in the United States, the Japanese automaker said Tuesday. Toyota reported an annual profit of 209 billion yen ($2.2 billion) over the last year, the company said at a news conference. That figure compares to a loss of 437 billion yen for fiscal year 2008. This is "still in a tough storm, but we are starting to see some sun on the horizon," Toyota President Akio Toyoda said, noting the challenge his company has faced in the wake of a continuing economic downturn and the recall of some 10 million of its cars. Net revenues for the fiscal year decreased of 7.7 percent compared to 2009, while operating revenue for the year recovered from a loss of 461 billion yen to a profit of 147.5 billion yen, the company announced. Cost-cutting measures helped make Toyota profitable. Vehicle sales for the fiscal year totaled 7.24 million units, a decrease of 330,000 units from the preceding fiscal year, Toyota said. Sales were up by 218,00 vehicles in Japan and another 74,000 units across the rest of Asia. The story was different in the United States and Europe, where sales fell by 114,000 and 204,000 units. Toyota cars and trucks have been the subject of at least three separate major recalls in the past year. One was for the "sticky pedal" situation in which gas pedals, as they age, begin to stick in a partially depressed position. Another was for gas pedals that can stick on some floor mats, and a third was for braking problems on Toyota Prius hybrid cars. In April, Toyota indicated to the U.S. government it would pay a $16.4 million fine -- the largest ever against an automaker -- for failing to notify the Department of Transportation of the "sticky pedal" defect for at least four months. Despite the problems, Toyota announced in late April that production soared more than 80 percent in March compared to year-ago levels. Toyota Tuesday predicted sales growth across the board for 2011, pinning its hopes on green cars and the emerging markets like India and China.